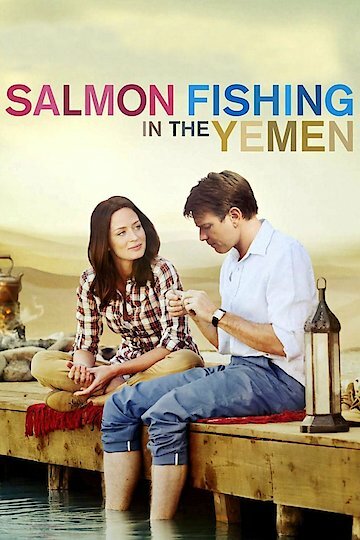 Salmon Fishing in the Yemen is a delightful comedy/drama starring Ewan McGregor as Dr. Alfred Jones, Britain's top expert on fisheries. Dr. Jones is approached by Harriet Chetwode-Talbot (played by Emily Blunt) with a plan to bring salmon fishing to the desert of Yemen. She speaks on behalf of Sheikh Muhammed of Yemen who believes that his passion for fly fishing may rub off on the rest of the inhabitants of the desert and in turn bring peace to the land. He has seemingly unlimited resources and price is no object when it comes to realizing his dream. Dr. Jones finds the whole idea to be impractical as well as scientifically impossible. He explains to Harriet that salmon require a very specific set of circumstances to thrive and there is no way to recreate them in the desert of Yemen. However, Harriet is adamant that they can make it work because they have all of the sheikhs resources at their disposal. She invites him to Yemen with her to meet Sheikh Muhammed and hear his fervent tale of why his project must come to fruition. Dr. Jones agrees to accompany Harriet to Yemen and thus begins their adventure. After speaking with Sheikh Muhammed about his dream of bringing peace to the people of Yemen through the comradery the sport of fly fishing would bring, Alfred reluctantly agrees to work on the project. Harriet also stays on in Yemen to assist him. As the months pass, Alfred is caught up in Harriet's optimism and passion for their endeavor and finds himself actually believing that they can make it work. Through the ups and downs, and setbacks and triumphs, Salmon Fishing in the Yemen shows us just how much perseverance, hope, and the human spirit can accomplish. Salmon Fishing in the Yemen is currently available to watch and stream, download, buy on demand at Amazon Prime, Amazon, Vudu, Google Play, FandangoNow, iTunes, YouTube VOD online.